Manometric profile after Laparoscopic Nissen Fundoplication and Endoluminal Fundoplication: A comparative study. 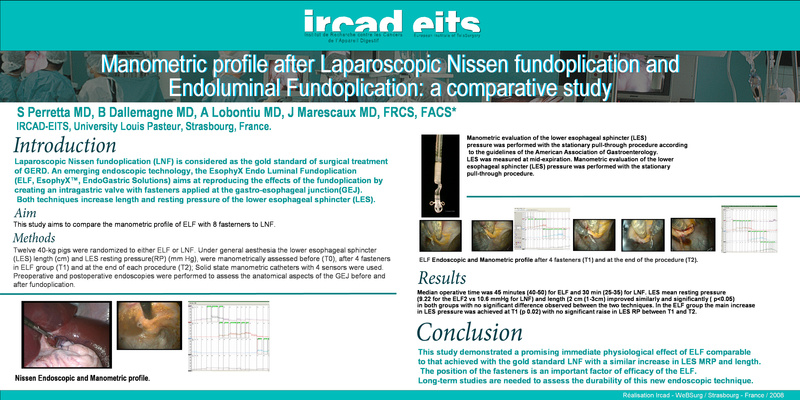 Laparoscopic Nissen Fundoplication (LNF) is considered the gold standard of surgical treatment of GERD. An emerging endoscopic technology, the EsophyX (EsophyX™, EndoGastric Solutions Inc.) Endo Luminal Fundoplication (ELF), aims at reproducing the effect of the fundoplication by creating an intragastric valve with fasteners applied at the Gastro-Esophageal Junction (GEJ). Both techniques increase resting pressure and length of the Lower Esophageal Sphincter (LES). This study aims to compare the manometric profile of ELF with 8 fasteners to LNF. Twelve 40-kg pigs were randomized to either ELF or LNF. Under general aesthesia the LES resting pressure (mm Hg) and length (cm), were manometrically assessed before (T0) and immediately after (T2) each procedure (ELF and LNF). In the ELF group manometry was carried out midway through as well, after the placement of 4 corner fasteners (T1). Solid state manometric catheters with 4 sensors were used. Preoperative endoscopies were performed to assess the anatomy and location of the GEJ before and after fundoplication.